I’m sure I would have been as unsettled as Mary and the disciples, barely able to comprehend what had happened. He was dead and they knew it. He was placed in the tomb and it was sealed. Now it stands empty! A wonderful mystery is explained in the death, burial and resurrection of Jesus. In Exodus and Leviticus, God gave Moses the instructions for the seven feasts of the Lord to be celebrated throughout their year. Each was to remind them of something. And each was a foreshadowing of things to come. At Palm Sunday, Jesus was singled out as the Passover Lamb. He was arrested on the night of Passover. He was crucified and died on the feast of Unleavened Bread. He who was the incorruptible Bread of Life said a grain of wheat must first die in order to produce much fruit. His body lay in the tomb on Saturday, the Sabbath day of rest. The day after Sabbath was the Feast of Firstfruits. And on that day He arose from the dead, being an example of resurrected life for those who would follow Him. According to Leviticus 23, the Feast of First Fruits was to be the day after the Sabbath (or the first Sunday) during the seven days of Unleavened Bread. When the people finally settled in the Promised Land, the first crop of the season was a taste of what was to come. They were to offer a portion of it to God along with a burnt offering. This crop was the first of their fruits. More would come later. Only God could have orchestrated the calendar to work out perfectly. Remember that the Jewish month is according to the moon’s cycle. So Passover could fall on any day of the week as the years go by. On Jesus’ last Passover, it was a Thursday when he ate with His disciples in the upper room. It was Friday and the beginning of the Feast of Unleavened Bread when he was crucified and died. Scripture confirms the days because of the hasty burial due to the Sabbath coming at sundown. 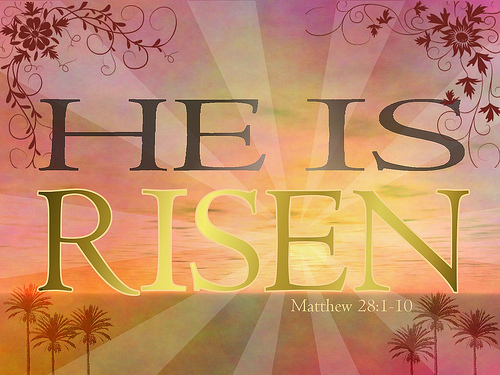 And it was Sunday when He defied death, hell and the grave and claimed victory for us. Though we walk through the valleys of suffering, heartache, pain, and eventually death, Jesus fulfilling the Feast of Firstfruits bears witness that we also shall live. Jesus’ resurrected life provides the hope of resurrection for me. Because He lives, I shall live also. That is something to shout about! Share your Resurrection Sunday with me in a comment.